Adam Brown has written a new – TERRIFIC – book for the diabetes community, full of the same brilliant, actionable advice that we’ve come to happily expect from his diaTribe columns. His book, Bright Spots & Landmines, is billed as “the diabetes guide I wish someone had handed me,” and that sentiment is absolutely correct. This book is a powerful tool that people living with diabetes can pour through and make their own, with moments of reflection and inspiration interspersed among research, recipes, and amazing graphic design. Kerri: What inspired you to write Bright Spots & Landmines? Adam: When I started writing my diaTribe column (Adam’s Corner) four years ago, I never would have guessed that more than half a million people would read it! I’ve received hundreds of emails and comments sharing gratitude and kindness, which is what motivated me to do something loftier with Bright Spots & Landmines. Each Adam’s Corner column stands alone, so I wanted this book to be a single guide that distills all the most helpful diabetes tips I’ve learned in four areas: food, mindset, exercise, and sleep. Kerri: What makes Bright Spots & Landmines different from what’s already out there? Adam: I agonized over this question before writing this book – I wanted to make sure Bright Spots & Landmines would add value! Bright Spots & Landmines is written from a person-with-diabetes perspective and based on more than 10,000 hours writing professionally about diabetes, over 50,000 hours of personal learning from CGM, and everything I’ve taken away from hundreds of diabetes conferences and leading thinkers. The book focuses on food, mindset, exercise, and sleep, which are not often addressed in the same actionable diabetes guide. Bright Spots & Landmines went through an extensive feedback process, with a combined 500+ years of diabetes experience between all the reviewers – yourself included! Last (and perhaps most important), my girlfriend, Priscilla Leung, did all the wonderful illustrations and graphics in the book – these really make the writing come to life. I’m as proud of how it looks as I am of the words! Kerri: How do you want readers to feel after reading your book? Adam: Uplifted, positive, and ready to try some new things and experiment! I hope people leave Bright Spots & Landmines with tangible actions and nuggets they can use to improve their life with diabetes – whether it’s a recipe I eat, a quote I like, or an answer to question that the book poses to them. I hope this book also reminds readers that we all have moments of enormous diabetes frustration, self-sabotaging food decisions, negative thoughts and questions, busy days where exercise is hard to fit in, and nights without enough sleep. 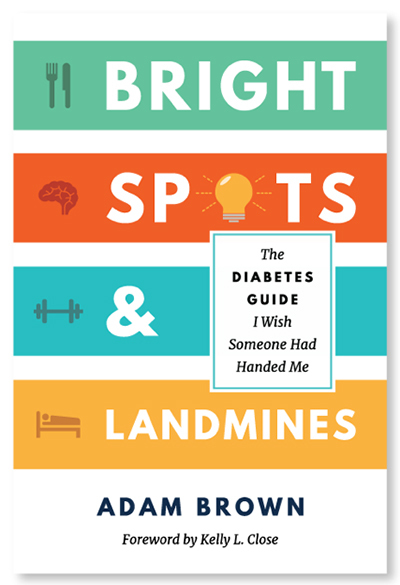 Bright Spots & Landmines shares my toolkit for navigating the choppy, unpredictable waters of living with diabetes. I hope it puts some wind in readers’ sails. Kerri: Is Bright Spots & Landmines made up of rules for living well with diabetes, or are these suggestions for people to implement in their own lives? Adam: Awesome question! This is a book filled with things that have made an enormous difference in my life with diabetes. By sharing them, I hope readers will glean tips they can try or adapt to fit their needs. For instance, chia pudding is one that has been fascinating to follow. Some readers make it exactly like I do and love it! Others have tinkered with the recipe to fit their needs. And for others, it’s not a fit. I expect this variance with all 43 Bright Spots and 16 Landmines in the book – some will resonate, some will need to be adapted, and some won’t apply. This is why each chapter – food, mindset, exercise, and sleep – concludes with Bright Spots & Landmines questions so readers can identify what works for them. Kerri: Is this a book you would want to give newly diagnosed PWD? Long-timers? Caregivers? Is there something for each group in this book? Adam: All of the above – and I don’t say that lightly. Every one of these groups read drafts of the book. A mom of a newly diagnosed son read Bright Spots & Landmines, as did a woman with over 50 years living with diabetes. Other readers fell in between (see testimonials and Amazon reviews). I even had some people with prediabetes read the book and find it useful! Kerri: What was your favorite part to write? Adam: I love the Mindset chapter most of all, even though it comes second in the book. (Of course, Food had to be first in a diabetes book.) The right Mindset is like rocket fuel for living better with diabetes – it underlies everything and can provide such a boost, even on the toughest days. This chapter shares lots of tips and tricks related to perfectionism, motivation, stress, goal setting, hacking my brain and habits, and beyond. I’m a voracious readers of psychology and self-help, which is probably why I had so much to say in this chapter. Kerri: What was the most challenging portion of this book for you to tackle? Adam: I struggled a lot with the title. We went through many iterations, including “Diabetes Bright Spots & Landmines” (too long), “Solving Diabetes” (a bit too presumptuous), and the original (read: not great) title, “Make Diabetes Awesome.” Probably the worst title in the original brainstorm was, “Diabetes should be less awful and more awesome.” Haha! I’m so happy about the final title:subtitle combination, since it really illustrates the book’s framework and why I wrote it in the first place. I also spent an enormous amount of time trying to figure out how to make the book as low cost as possible, but still look amazing. I originally wanted full color interior printing, but this made the book twice as expensive in paperback. I wasn’t willing to accept that tradeoff. I love the current model of a name-your-own price PDF download in full color, a paperback on Amazon for under $7 (the black-and-white interior still looks really good), and a Kindle version for $1.99. Funnily enough, the writing process was the easiest part, though getting feedback on the book was always scary. It’s never easy to show your work to other people. Kerri: What’s next, now that the book is live? Adam: For now, I’m laser focused on finding every possible avenue to get this book into people’s hands – whether that’s print copies or free digital versions. And we will certainly do follow-up Adam’s Corner articles that talk about different pieces of the book.I’d also love to do an audio version, video snippets of different Bright Spots & Landmines, weekly Facebook Live Q&As with readers, and perhaps translation into other languages. But whew… one thing at a time! If you have any ideas you’d like to see, please let me know at brightspots@diaTribe.org! Kerri: And how can people find more of your writing? Adam: Adam’s Corner is here on diaTribe.org, diaTribe’s Facebook page is here, and diaTribe’s twitter is here (@diaTribenews), and my twitter is here (@asbrown1). Kerri: Thanks so much for chatting, Adam. Also, you adopted a dog? Awesome! What kind? Adam: A mini schnauzer mix! I talk about him in the introduction and the exercise chapter  A dog is an incredible Mindset and Exercise Bright Spot, all in one package! I’m a huge convert, despite my skepticism when Priscilla wanted to adopt. Definitely one of the best life decisions we’ve made in the past year. 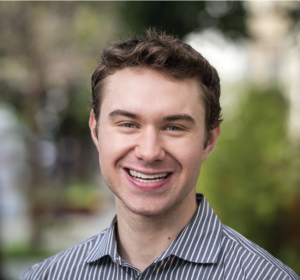 Adam is patient, ridiculously well-informed, and when it comes to bright spots in the diabetes community, don’t look directly at Adam or you may burn your eyes. Congratulations again on the book launch!!! Fingerpricks: An Interview with Haidee Soule Merritt. Why We Revolt: An Interview with Dr. Victor Montori Designing for Diabetes: An Interview with Natalie Balmain Interview: Anna Norton on the Future of Diabetes Sisters. It is a wonderful book. I applaud Adam for the wonderful work.